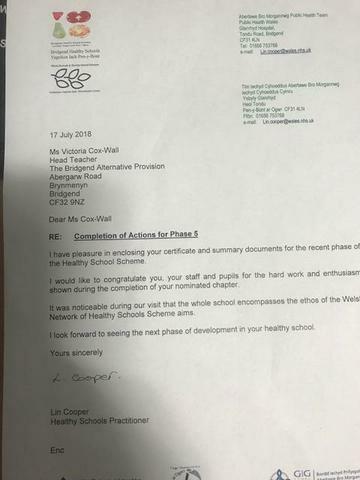 We are very pleased to announce we have been awarded the ABM Healthy Schools Award (as part of the Welsh Network of Healthy Schools Scheme) for Emotional and Mental Health. We are very proud of our support for wellbeing and mental health for both pupils and staff and where needed for our families via our Family Engagement Officer and other providers. The PRU in its old format (prior to 2014) had earned some of the Healthy Schools awards but this is our first as the Bridge and has been an important part of our journey. We were congratulated on the ethos of the Bridge and how we demonstrated this throughout. We look forward to displaying our new "leaf" on the achievement wall in reception!